Janice Ross, a dance studies scholar, historian and critic, researches the social, civic and aesthetic aspects of a wide range of dance practices by unusual dance communities including the practice of classical ballet by Hasidic women in Israel and dance in prisons globally. She has a B.A. from U.C. Berkeley and M.A. and Ph.D. degrees from Stanford. 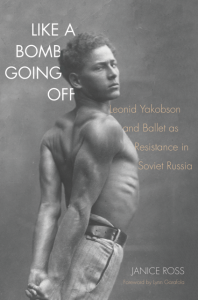 A Professor at Stanford University, she directs the Dance Program and is faculty director of ITALIC, a new residential arts immersion program, Her most recent book, Like A Bomb Going Off: Leonid Yakobson and Ballet as Resistance in Soviet Russia, (Yale University Press, 2015), explores the use of ballet as a form of resistance and coded Jewish identity in Soviet Russia during Stalin’s reign. Her book about dance experimentalist Anna Halprin, winner of the de la Torre Bueno 2008 Special Citation for advancing the field of dance studies, examines Halprin’s work in the context of West Coast post-war Beat culture, Anna Halprin: Experience as Dance, (UC Press 2007). She has also written about turn-of-the-century proto-feminist Physical Education teachers in America and their efforts to de-theatricalize dance to bring it into the university in Moving Lessons: Margaret H’Doubler and The Beginning of Dance in American Education, (University of Wisconsin 2001) and she has charted the history of America’s oldest ballet company, San Francisco Ballet, as a civic institution. where citizenship is rehearsed in San Francisco Ballet at 75 (Chronicle Books 2007). She has published numerous dance studies essays in anthologies including On Stage Alone: Soloists and The Modern Dance Canon,ed. Claudia Gitelman and Barbara Palfy, (University of Florida Press, 2012), Dignity in Motion: Dance, Human Rights and Social Justice, (Scarecrow Press 2008), Perspectives on Israeli and Jewish Dance, (Wayne State Press 2011), Performance and Ritual, ed. by Mark Franco (Routledge 2007), Everything Was Possible (Re) Inventing Dance in the 1960s, (UW Press 2003). 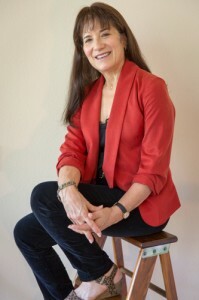 Her awards include a Guggenheim Fellowship, Fulbright Scholar Fellowship to Israel, two Stanford Humanities Center Fellowships, and Memorial Foundation for Jewish Culture Fellowship, Jacobs’ Pillow Research Fellowship, a Djerassi Resident Artists’ Program Fellowship and a 2014 “Izzie” for sustained achievement in dance writing. For 10 years she was the staff dance critic for The Oakland Tribune and for 20 years the San Francisco contributing editor to Dance Magazine. Her articles on dance have appeared in The New York Times and The Los Angeles Times among other publications. She is past president of both the international Society of Dance History Scholars and the Dance Critics Association. Born in 1959 in Kansas City, Missouri, USA, Andi Arnovitz now lives and works in Jerusalem, Israel. She creates installations, artists books, prints and large scale paper pieces from a wide range of media. These pieces reflect various tensions that exist within religion, gender and politics. Andi has participated in many international printmaking competitions. She has exhibited her work in England, The United States, Israel, Spain, Poland, Finland, France, Lithuania, Canada, and Bulgaria. 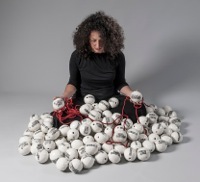 Her work is included in the collections of the United States Library of Congress, Yale University, the Yeshiva Museum in NYC, the Museum of Art in Ein Harod Israel, the Israeli Foreign Ministry and the Israel National LIbrary.She has had many one-woman shows and participated in multiple group shows. Her work is in many private collections in both the United States and in Europe. She is represented in Jerusalem by several galleries. In the coming year her work will be featured in several museum shows in Israel and the United States.